This is a page just for kids! Below are a ton of websites that have all sorts of fun stuff–games, activity sheets, songs, and more–all about nutrition. We all like to eat, but what exactly are we eating? Is it food that is going to help keep us feeling good, or is it food that will slow our bodies down? What can you do to be healthy today? Check out some of these website, for a start! 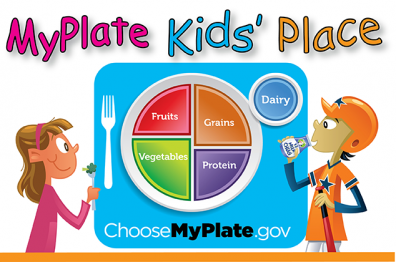 MyPlate Kid’s Place–Games, activity sheets, songs, recipes–all for kids! The Blast Off game lets you see how the foods you eat each day add up. Are you getting enough fruits and vegetables to fuel the spaceship? Don’t forget the exercise! Check out this “Smash Your Food” game! Guess how many sugar cubes, 1/8 teaspoons of salt, and teaspoons of oil are in each of the foods, then watch the food smasher smash to see if you guessed correctly. The Bam! Mind and Body: Food and Nutrition has some great information as well as tasty recipes.